The wealthy Ella Venable is murdered in her house by a man. 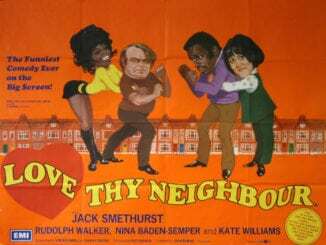 The man is her servant Andrew, and he’s in cahoots with her husband Walter and her housekeeper Clara. They bury the body, report Ella’s ‘disappearance’ to the police, who start investigating, and plan to share Ella’s considerable fortune with three more relatives who turn up and who were in on the plot, with only Ella’s daughter Beth seemingly innocent. However, they haven’t counted on Ella’s pet cat Tabitha. She witnessed the murder and the burial, and now begins to strike fear into the hearts of the villains and worse…. 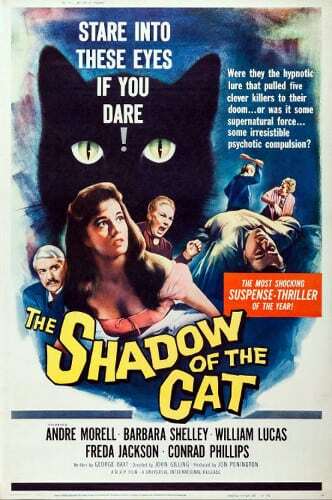 When I first saw The Shadow Of The Cat some twenty or so years ago, I had no idea that it was a Hammer film I was watching, despite some familiar names in the titles and some familiar-looking Bray interiors. Hammer just didn’t make their Gothic horrors in black and white, the whole thing had a different feel to normal, and of course the name Hammer didn’t appear in the credits. It’s not even listed as a Hammer picture in some books. I was most surprised to find out many years later that it actually was a Hammer film, though for some reason was trying not to be one. I recalled a fun, but silly, film which consisted little more than a bunch of scheming relatives in an old dark house trying to kill a cat and the animal gradually polishing the humans off. Keen for more moggy mayhem ever since I watched [and reviewed] Lucio Fulci’s weird version of Edgar Allan Poe’s The Black Cat a short while ago, I was most pleased that the movie was almost exactly as I recalled it. Its 79 minutes do indeed consist almost entirely of a bunch of scheming relatives in an old dark house trying to kill a cat and the animal gradually polishing the humans off. Simplicity can be a good thing. 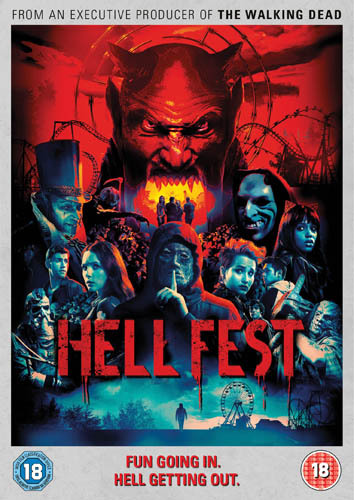 The film is often hard to take seriously, and its story never develops, but it’s quite a tight, efficient little piece with no fat on it and it’s certainly something of a Hammer curio full of interest which isn’t at all deserving of its near obscurity for many years, even if it’s hardly any sort of classic, even of the minor kind. 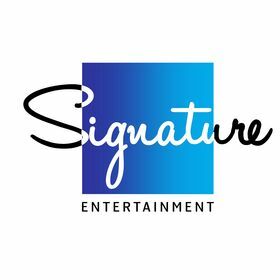 Like many films, The Shadow Of The Cat began life as a company set up specifically to produce it. One of the people involved in BHO Films was writer George Baxt, who had made script contributions, though under a pseudonym, to Hammer’s The Revenge Of Frankenstein. BHO offered the film to Hammer who initially rejected it, but then changed their minds. Director John Gilling, in his first directorial job for the studio, rewrote [though un-credited] the script to alter the cat from being a suggestion in the minds of the conspirators to a real animal that would be seen. Shot, as usual, at Bray and Black Park, the production was caused much trouble by its cat, who was borrowed from the landlady of the Duke of Edinbugh pub in Windsor. It kept disappearing, so much so that several stray lookalikes were brought in, though it’s no wonder [animal lovers won’t enjoy reading this] when, in a scene where it had to do a leap, the guy with the cat tried to throw it, then, when it wouldn’t let go, had somebody gave it a mild electric shock to get it to move. The cat did get its own back though. It pooed all over the guy holding it. 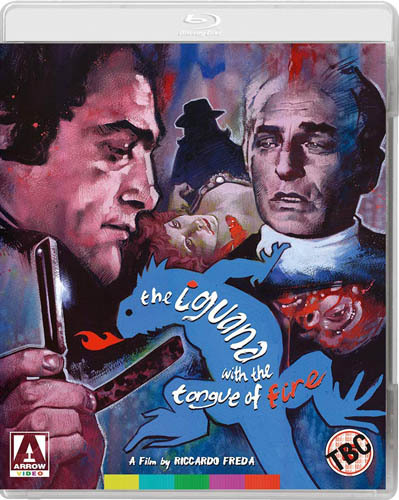 The BBFC required that the murder of Aunt Ella be shortened [though it was restored in 2014] and the film went out in both the UK and the US, distributed by Universal, with The Curse Of The Werewolf. 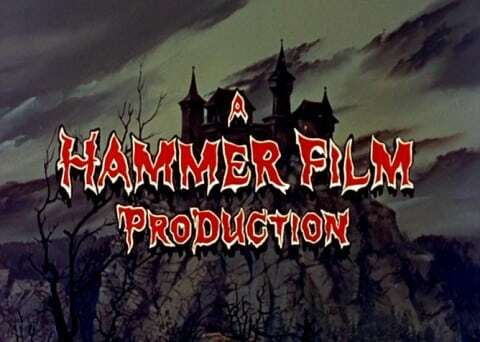 The reason as to why Hammer received no credit on the print has never been proven, but it could be due to Hammer’s deal with Columbia, where they were only allowed to make one film a year for other distributors, so they had to pretend that one half of a Hammer double bill made for Universal was not a Hammer film. The double bill only did average business, though The Shadow Of The Cat got better reviews than usual for Hammer. 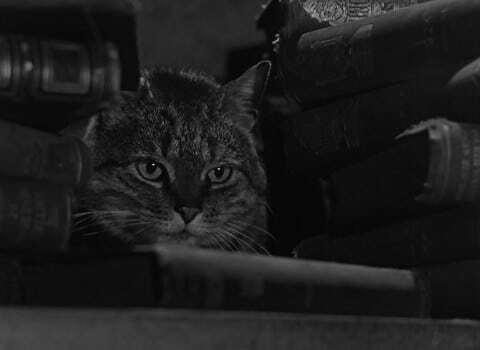 Hammer’s only flirtation with the world of Edgar Allan Poe [it’s clearly influenced by The Black Cat] opens with the camera tracking across a room, taking in a will and a picture of a cat over which Aunt Ella is revealed to be the person who is reading Poe’s The Raven. In what is a very strong opening, a man, face unseen, is coming up the stairs with a mallet. Ella sees him advance towards her, all blurry because she’s taken her glasses off, and then she’s bashed to death quite a few times. The scene is shown from the point of view of Tabitha, Ella’s cat, so the picture is stretched, though this only slightly minimises the quite shocking, if bloodless, brutality of the killing. The music score only kicks in when Walter and Clara have rushed in and they all go outside to bury the body, and only now do the titles begin. 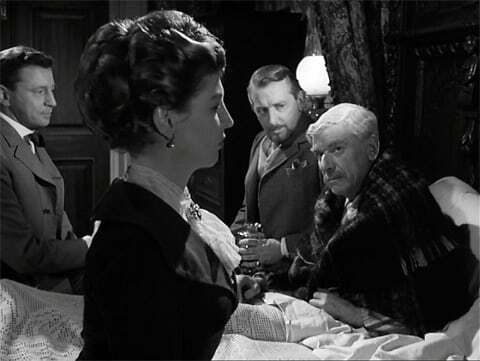 The film barely bothers with any scene setting thereafter; Walter, Andrew and Clara are bothered by Tabitha almost immediately and try to catch her without success. In a rather amusing sequence, they think they have it trapped in the cellar but Walter accidentally whacks Andrew with the poker he’s holding [I lost count of the number of times somebody swung a poker or something similar at the cat and/or fell over] and Walter has a heart attack. Then some more relatives turn up, also part of the conspiracy, and one odd thing about this movie is that it’s conceptually so simple yet it’s possible to lose track with all the stuff about wills and inheritances at times. There is one sympathetic relative though, and this is Ella’s daughter Beth. 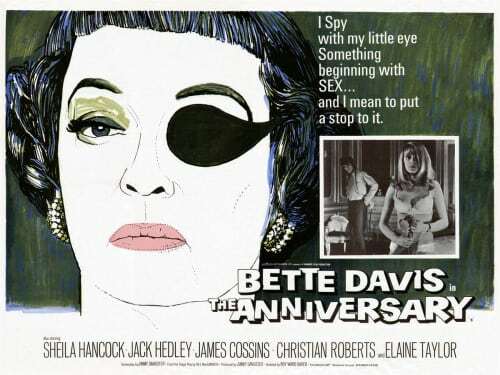 She also arrives in the house, and soon suspects that something is up, along with her policeman boyfriend, by the fact that Tabitha is friendly to her but seems to put the fear of God into everyone else, but one notable disappointment about this movie is that its heroine never seems to be in peril. The other family members occasionally mention about killing her off but never get around to try to do it, while of course she’s never in danger from the cat at all, though the film confusingly gives us a couple of moments that suggest that she may be. Most of the rest of the movie is villains vs. cat. Said villains die in elaborate death scenes, from being led into a quagmire to being made to fall downstairs, though there’s oddly no clawing onscreen, only the aftermath, and these stupid relatives have a habit of putting themselves in considerable peril as they try to get at the cat who can then easily kill them. It’s all a lot of fun, but rather funny, though it’s possible that the film is partly aware of its own absurdity with lots of lines like: “Things have come to a fine pass when one small animal can terrorise a house full of adults”. It doesn’t help [or maybe it does and actually enhances the entertainment value] that the porky tabby feline is not all menacing, even when shown in partial darkness with eyes glowing. A scene where she is handled roughly is accomplished with a rather convincing model and I had to rewind the film to check. It doesn’t seem that The Shadow Of The Cat ever really tries to be scary, though it’s possible that the original’s conception could have resulted in that, so its occasional comic relief, which include two cops and a genuinely witty and surprising coda where another family moves into the house, encounter Tabitha, and wonder if the grandfather could be persuaded to change his will which leads one to believe that the cat will start killing people all over again – doesn’t really jar. The screenplay does characterise most of the humans quite well, apart from our dull lovers, and some become a little more sympathetic as the story proceeds. One of them has escaped from Dartmoor, and worries if the cops will recognise him but, in another example of the screenplay not following something through, no such scene happens. The big question is if the film would have been better in its original incarnation. My answer would be yes, but it may not have been as sheerly enjoyable. The cast, which includes The Brides Of Dracula’s Freda Jackson, perform with conviction and go a long way towards making The Shadow Of The Cat as good as it is, though the divine Barbara Shelley, in her second Hammer part, has very little to work with. John Gilling directs with some style, from his ‘cat vision’ to even a tiny bit of shaky handheld camerawork, while Arthur Grant’s black and white cinematography is fluid but not really making the most of its setting. Aside from one jaunty [but appropriate to the scenes it’s used in] motif, Mikis Theodorakis [an interesting choice]’s music score positively throbs with suspense, especially in one oft-repeated passage where dissonant orchestral patterns in the lower registers and screeching utterances in the higher ones combine to musically evoke the terror of a cat more than any action we see onscreen. Eccentric, absurd but never dull for a moment and full of that charm you don’t get to see very often these days, The Shadow Of The Cat barely counts as a horror movie considering the total lack of chill it installs in the viewer, and could almost be said to be more a comedy but, much like The Stranglers Of Bombay [though in a very different way], suggests intriguing directions which by and large Hammer chose not to go down. 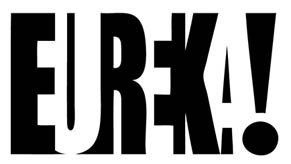 Though perhaps best considered as an experiment, it’s a thoroughly pleasant diversion that I reckon I’ll re-watch more often than many more notable works.